Twin-stick shooters and bullet hell: these are a few of my favourite things. Many indie games are hearkening back to the classic days of arcade games and bringing together well-known genres with cutting-edge technology, music and animation. Assault Android Cactus is a great example of this ‘brand new retro’ development philosophy, and the result is a hugely entertaining game that is somehow both warmly nostalgic and startlingly fresh. The storyline, such as it is, revolves around a civilian transport spaceship that has put out a distress call to Cactus, an android space police officer. Somehow the ship’s automated systems have turned on its human crew and need to be dealt with. Enter: twin stick shooting and bullet hell. A ‘twin-stick’ shooter is perhaps best exemplified by the Midway arcade classic Smash TV, which had no buttons but just two joysticks. The game has a top-down view on a room (in this case), and you played as the hero in a Running man-style TV bloodsport up against hordes of weird mutated enemies. The left joystick controlled your movement and the right joystick controlled a constant stream of fire from whatever kind of gun you were carrying (with no ammunition limit). This is the core mechanic for Assault Android Cactus. ‘Bullet hell’ is perhaps more common, and can be seen in vertically-scrolling games like 1942 or Raiden, as well as side-scrolling games like R-Type. The idea here is that you are in a spaceship (or plane) being shot at by countless opponents, and the skill is in dodging hundreds of bullets while getting some of your own shots in. Bringing these two mechanics together, Assault Android Cactus has the player feeling powerful and in control one minute, and hopelessly outnumbered, beleaguered, and shot down the next. Environments and power-ups are expertly designed to add variety and challenge to the game, and unlockable characters mean more interesting varieties of gameplay as you progress through levels. Although most levels take place in a fixed room (sometimes scrolling), the walls shift and disappear to reveal new tactical options or present new enemies. Downed enemies drop power-ups and battery (life) rechargers which force to to move around the screen rather than play it safe. A sophisticated scoring and ranking system encourages you to replay levels and work harder to apply new skills and abilities. Although it is essentially a shooting game, Assault Android Cactus is as kid-friendly as possible, earning is a PG rating from the Australian Classification Board. The offline, single-screen cooperative mode makes face-to-face multiplayer possible, so this kind of game is ideal for the lounge room or Game Truck. All the enemies are angry robots rather than living creatures, and the protagonists (androids) are often stunned but never die: they just lose battery and have to restart the mission. Despite lots of very hectic on-screen action, the shooting is all very stylised and very distanced from the realism of military shooters. The high level of action and skills necessary does mean it will probably be less appropriate for younger players, though. 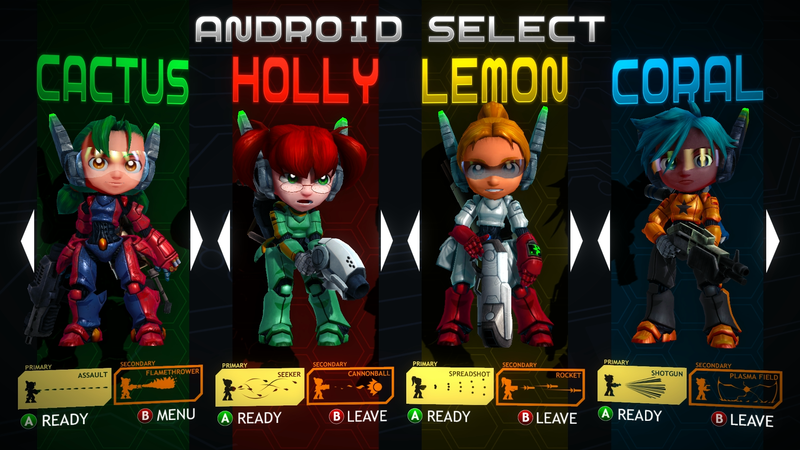 What’s even better is that Assault Android Cactus is an Australian-developed game, supported by the now-defunct Screen Australia scheme to support local game development. This means that by enjoying an awesome video game you are supporting Australian industry and job creation, at a time when traditional industries are sadly in decline. The best reason to get on this game, though, is that it is simply spectacular fun. No Replies to "Review: Assault Android Cactus (PC)"